Authors: Williams, C. R. S.
Abstract: Optoelectronic systems have many important applications, and they have become ubiquitous in the contexts of communications and sensing. In recent years, optical and optoelectronic systems have been of interest for two newer purposes: generators of random bits and test-beds for dynamical systems and chaos theory. Random bit generators are needed for secure communication, encryption, and Monte Carlo simulations. 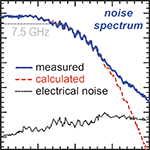 Algorithm-based pseudorandom number generators are susceptible to being hacked or producing incorrect numerical results in simulation, so physical noise-based sources of random numbers are needed. We have constructed a random bit generator based on amplified spontaneous emission (ASE), with generation rates of 12.5 Gbit/sec . We develop an understanding of the mechanism behind generating random bits from ASE, and we demonstrate its suitability as a random number generator by standard statistical testing used to evaluate random bits. This is the first use of ASE as a physical random number generator (RNG). Coupled dynamical systems are present in numerous contexts of the natural and man-made world. From neurons in the brain, to coupled lasers, to pedestrians on a bridge, it is important to understand how coupled dynamical systems or oscillators can synchronize in different ways. Sorrentino and Ott first proposed a theoretical formulation that described a counterintuitive phenomenon they referred to as group synchrony . We show an experimental realization of group synchrony, in which the oscillators are grouped based on different parameters for each group . Despite being coupled only to the oscillators in the dissimilar group, oscillators in the same group identically synchronize, through the mediation by the other group. We also show an experimental realization of a uni-directional ring coupling configuration, with tunable coupling delays. By changing the coupling delays, we show that it is possible to obtain different synchronization states. We compare experimental results to numerical simulations and calculations of the stability of the synchronous states. We present an experiment of four delay-coupled optoelectronic oscillators as the first experimental observations of both of these novel synchronization phenomena in simple networks of coupled oscillators.